It is an August afternoon in 1969. A hippie -family- led by Charles Manson commits five savage murders in the canyons above L.A. The same day, a young, ex-communicated theology student walks Hollywood Boulevard, having just arrived in town with the images of Elizabeth Taylor and Montgomery Clift tattooed on his shaved head. At once childlike and violent, Vikar is not a cineaste but -cineautistic, - sleeping in the Roosevelt Hotel where he is haunted by the ghost of D. W. Griffith. He has stepped into the vortex of a culture in upheaval: drugs that frighten him, a sexuality that consumes him, a music he doesn’t understand. He’s come to Hollywood to pursue his obsession with film, only to find a Hollywood that’s as indifferent to film as it is to Vikar. While the movies have appeared in a number of Steve Erickson’s novels, from Days Between Stations to The Sea Came in at Midnight, they dominate Zeroville with the force of revelation. Over the decade of the seventies and into the eighties, as the old studios crumble before the onslaught of a new renegade generation, Vikar becomes an unlikely film editor, possessed of an astonishing artistic vision. Through his encounters with starlets, burglars, revolutionaries, escorts, punk musicians and veteran film-makers, he discovers the secret that lies in every motion picture ever made. 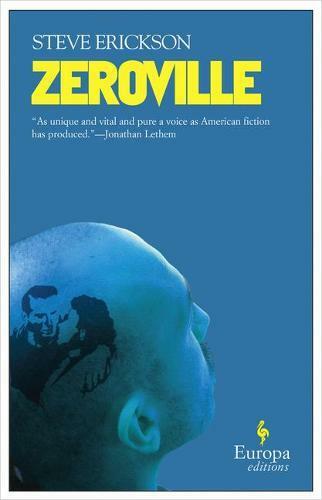 Combining an epic scope with popular accessibility in the spirit of its subject, Zeroville is the ultimate novel about the Movies, and the way we don’t dream them but rather they dream us.